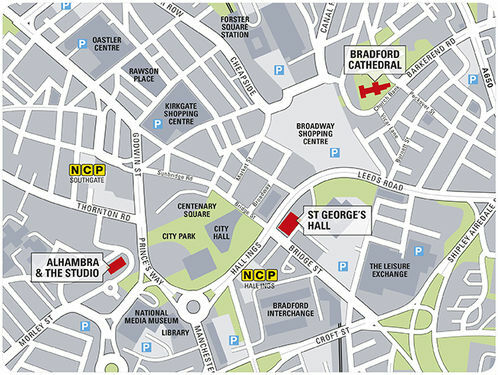 You can park at the NCP Hall Ings (BD1 5SD) or NCP Southgate (BD1 2AP) and receive their exclusive car parking discount for people attending our venues. Vouchers are available from the Box Office when you buy or collect your tickets, or can be requested before the show from bars and kiosk (subject to availability). There are a number of other car parks in the city centre within close walking distance of our venues. These include The Broadway Shopping Centre; Crown Court; Kirkgate Shopping Centre (daytime only); Leisure Exchange; NCP on Hall Ings or Southgate (discount voucher available for Bradford Theatres bookers); Oastler Centre; Sharpe Street (behind the National Media Museum). The car parks in the city centre can be very busy during the daytime – please allow a little extra time to make your journey to the venue. You can find further information on Bradford Council’s website.